RALEIGH, NC – For the past 20 years, Dr. Michael Milano of Apex has tirelessly volunteered by providing free dental exams, arranging follow-up care, recruiting more than 1,000 dental professionals, writing grants, publishing related peer-reviewed research, and presenting medical education to improve dental care and smiles for individuals with intellectual disabilities. “Dr. 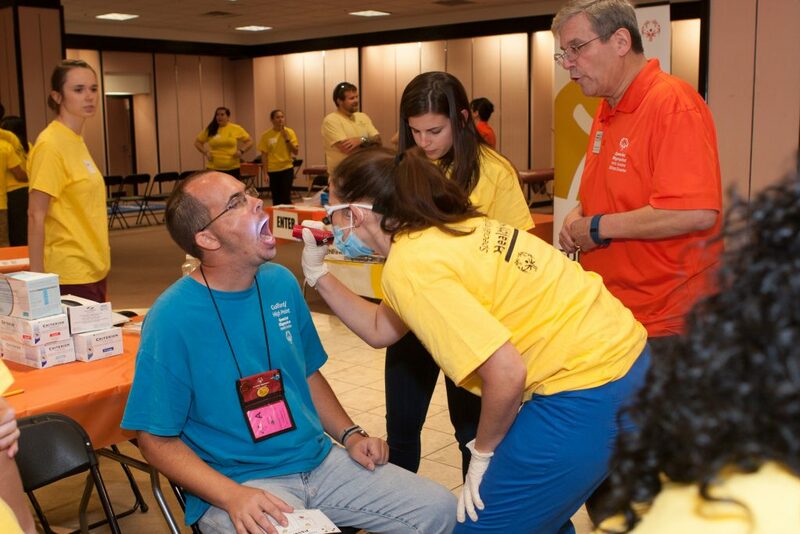 Milano’s commitment to dental health, the Special Smiles program, and the Special Olympics community is second to none,” said Keith L. Fishburne, Special Olympics North Carolina President and CEO. 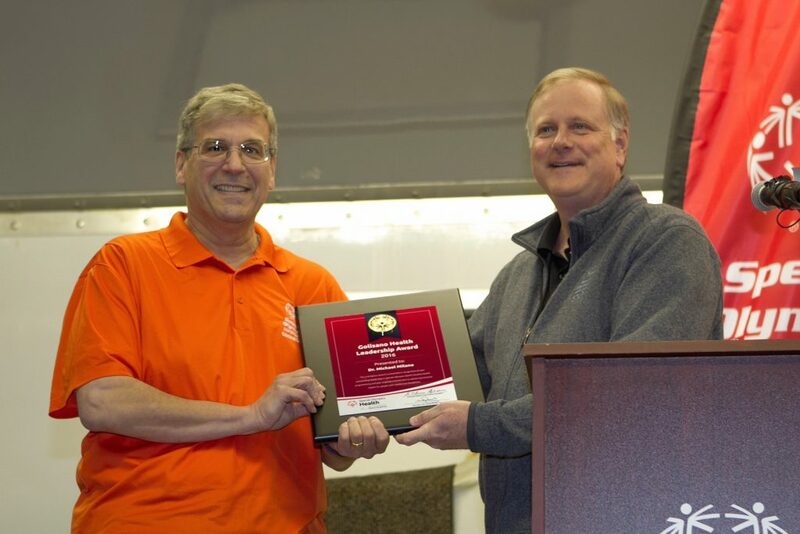 In a special tribute during Opening Ceremonies at the Special Olympics NC Fall Tournament in High Point, Fishburne announced the selection of Dr. Michael Milano as the 2016 recipient of the prestigious Golisano Health Leadership Award. 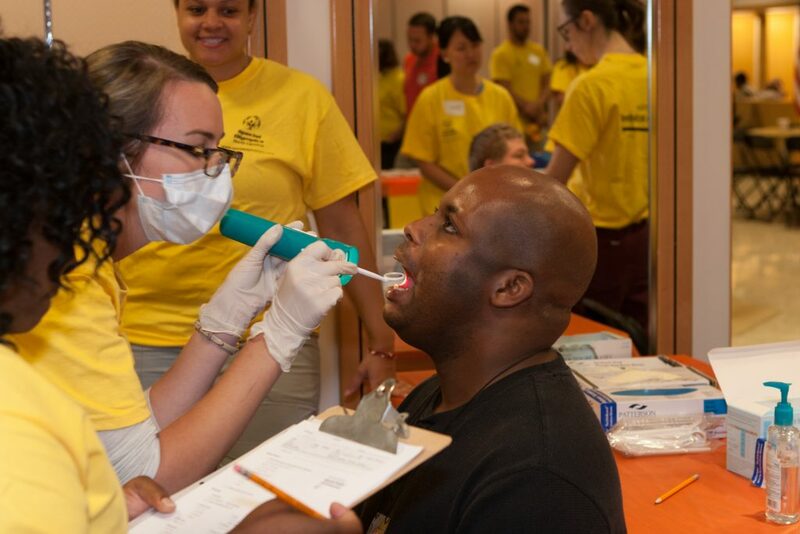 The following day, Dr. Milano and 40 volunteers he recruited, provided free dental exams, oral hygiene instruction, and mouth guards to 165 Special Olympics athletes. People with intellectual disabilities are one of the largest and most medically underserved disability groups in the world. Millions with intellectual disabilities lack access to quality health care and experience dramatically higher rates of preventable disease, chronic pain and suffering, and premature death in every country around the world. 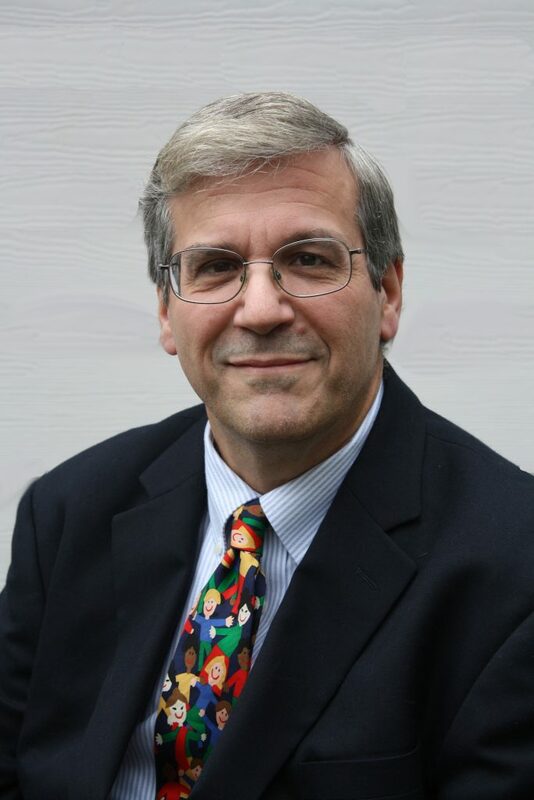 As a faculty member at the University of North Carolina School of Dentistry, Dr. Milano has forged a partnership with the Dental School to increase access to quality dental care for individuals with intellectual disabilities. Milano maintains a statewide list of over 50 dental providers who welcome and enable Special Olympics athletes to find appropriate follow-up care. Presented every two years to individuals or organizations dedicated to improving quality health care and advancing the health initiatives of Special Olympics, the Golisano Health Leadership Awards are a global partnership between Special Olympics and the Golisano Foundation. Milano is one of up to 32 individuals or organizations in the international Special Olympics community receiving the Golisano Health Leadership Award in 2016. Up to seven honorees will be selected to receive the global award at the 2017 Special Olympics World Winter Games in Austria this March. The Golisano Foundation and philanthropist and Paychex founder Tom Golisano, have committed $37-million since 2012 to Special Olympics health programs to increase access to inclusive health, fitness, and wellness programs for people with intellectual disabilities in their local communities. Special Smiles is one of seven non-invasive screening programs provided free of charge to Special Olympics athletes through Special Olympics’ global health program, made possible by the Golisano Foundation. These programs provide more than 1.7-million free health examinations in more than 130-countries, making Special Olympics the largest global public health organization dedicated to serving people with intellectual disabilities. Over the next five years, Special Olympics North Carolina will expand healthcare screenings and incorporate new programs focused on healthy lifestyles, including nutrition. Coordinating the healthcare movement in North Carolina for nearly 40,000 Special Olympics athletes, is Ellen Fahey, SONC Health Director (efahey@sonc.net).